Must have visible snow in the photo. 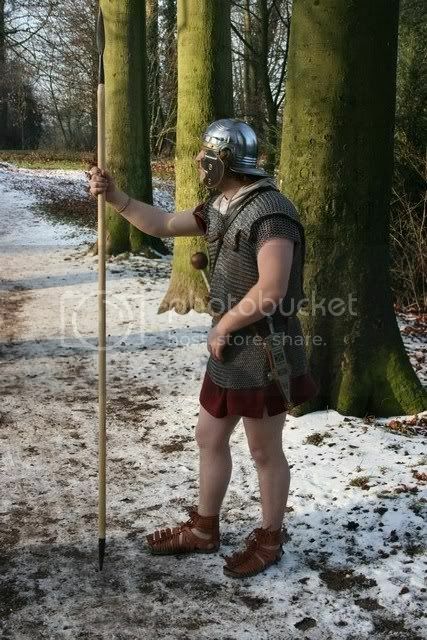 Roman Soldiers Civilians or enemies of Rome. 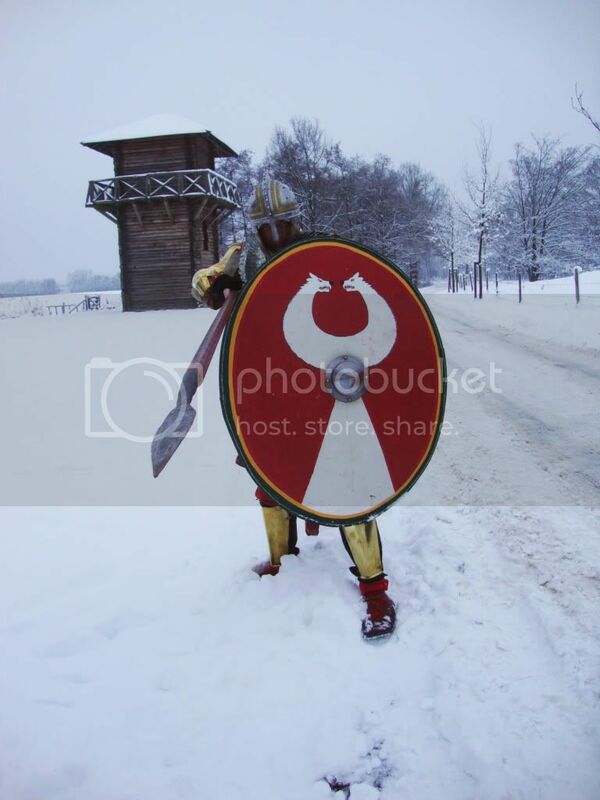 I'm also planning on doing whole winter photoshoot with our cavalryteam during the comming winter. There's that cool tower! It looks good in the snow. You should have some torches up there on a misty snowy day for a picture. 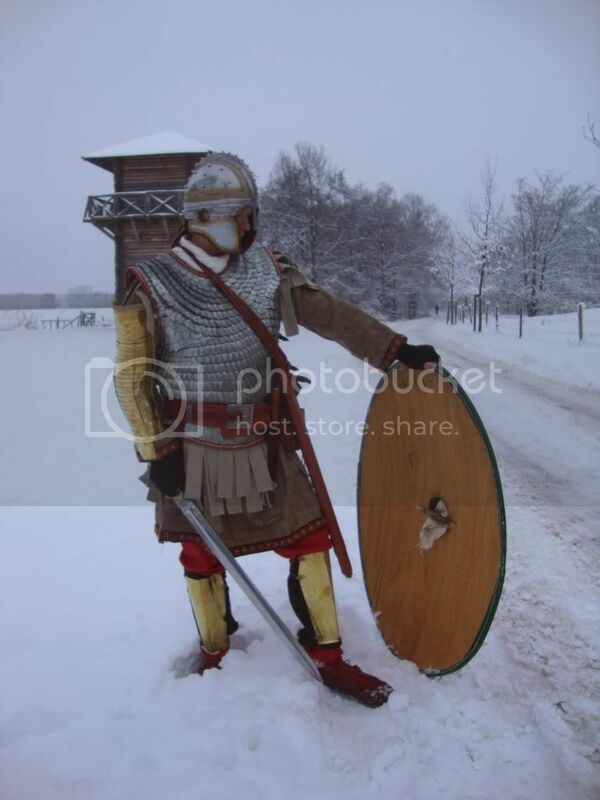 What happens to your helmet or armour in extremely cold weather? Does it conduct the cold to you, or conduct your body heat out? What did Romans do about their caligue/ sandals in the cold? they would have lined the insides with fabrics and then slide their feet inside. Or they would have make thick coverings, in relation to socks. Anything to stop frostbite at least! Then later the Romans adopted more boot-like shoes right? Great chilly pics, Jurjen & Robert! In the context of 4th century there have been no finds (at least to my knowledge) of high-ankle boots, only the shallower "deurne" types? In my opinion there must have been more suitable gear for the different weather conditions too, like higher boots and mits etc. What do you guys think? Good foot coverings are a must. 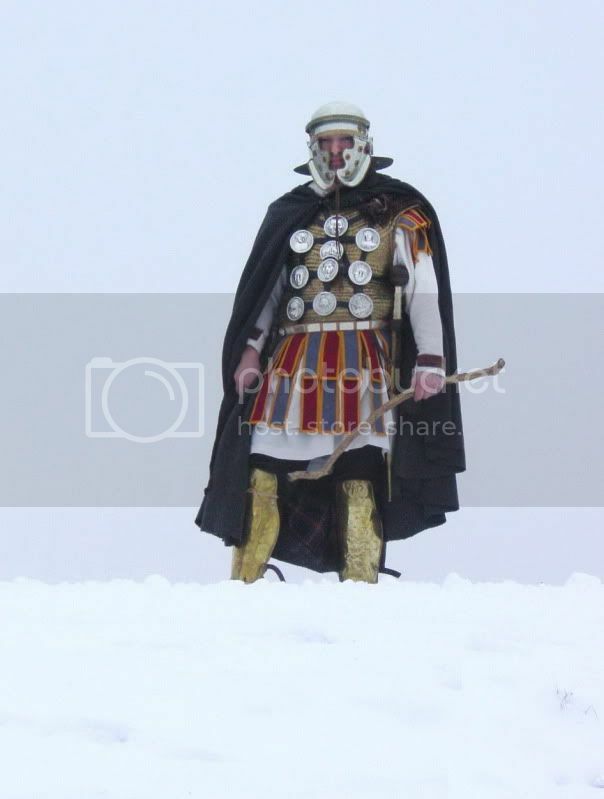 Hellenistic clothing easily copes with low temperatures, I've spent a day at -9 degrees and I expect our Polish and Canadian friends can easily beat that. This is very late Roman! Everyone looks very cool!! Very cool indeed! i have stil lto get any photos done in the snow, although it has been an ambition of mine for a few years. Fell boots, well waterproofed, and good socks are a must in the winter. i wouldn't be surprised if Caesars troops had half-inched the closed footwear of the northern tribes as far back as the Gaulic Wars. With Europe covered in snow (snow in Rome, -5 C! )I think it might be time for more photos! Quote: I think it might be time for more photos! Stop throwing... those bloody snowballs... at me! Where would we be without them to hold the camera though? :wink: My son was freezing, it wasn't as cold as yesterday, but the wind was blowing quite stronger!